The efforts of Cambridge civic and community leaders were honored today when America’s Promise Alliance (the Alliance), the nation’s largest partnership organization dedicated to youth and children, announced the city had been named a winner of the Alliance’s 100 Best Communities for Young People (100 Best) competition presented by ING. The 100 Best designation recognizes those communities that make youth a priority by implementing programs that help keep children in school and prepare them for college and the 21st century workforce. The competition is open to all communities that make children and youth a priority, including small towns, large cities, counties and school districts. In addition to enhancing local educational opportunities, most winning communities have taken steps to facilitate improved access to health care for its young people, encourage youth civic engagement and supply developmental resources that create better places for young people to live and grow. 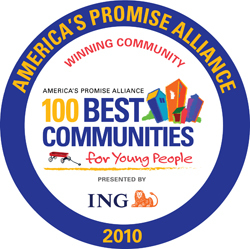 The entire 2010 list of 100 Best Communities for Young People and their accomplishments can be found at www.americaspromise.org/100Best. Cambridge was named one of the nation’s 100 Best for its many collaborative efforts to provide all of its children and youth with opportunities to become successful contributors to society. Among those efforts is Cambridge’s recently piloted “Baby University” program, modeled after the Harlem Children’s Zone’s Baby College Program to begin with very young children to address the achievement gap. The program works primarily with families who live in subsidized housing, offering workshops on brain development, literacy and health, as well as home visits and interactive playgroups, to help families ensure that their children enter school ready to learn. Cambridge was also recognized for its long-term commitment to reversing its growing childhood obesity rate. The 10-year collaboration of public schools, health service providers and agencies has created Healthy Living Cambridge Kids. The program is proving successful with more nutritious school lunches, increased physical education throughout the school day and new wellness policies. Cambridge and the other winners spanning 37 states were recognized at a ceremony on Sept. 21 in front of the Washington Monument on the National Mall in Washington, D.C. Each of the winning communities was formally recognized with a designation on a map of the U.S., illustrating the geographic and demographic diversity of the winning 100 communities. In addition to the 100 Best distinction, Cambridge and the other top communities will receive two road signs identifying the city as one of 100 Best, as well as a trophy to be presented to local officials later this year. Alliance Chair Alma Powell and President and CEO Marguerite W. Kondracke revealed the list of winners during the national celebration. They were joined by Rhonda Mims, president of the ING Foundation and senior vice president, ING’s Office of Corporate Responsibility and Multicultural Affairs and Twilight’s Kellan Lutz, who both share a passion for the development of young people. The competition is one element of the Alliance’s Grad Nation campaign, a 10-year initiative to mobilize all Americans to take action in their communities to end the high school dropout crisis and prepare young people for college and the 21st century workforce. More than 7,000 students drop out each school day in the U.S., resulting in 1.3 million young people a year. To help decrease these numbers, the Alliance is more committed than ever to recognizing communities – regardless of size, location or history – that are taking real action to help more young people stay in school and graduate on time. First held in 2005, 100 Best honors communities large and small, rural and urban, that are making progress to help young people achieve their potential, which includes earning a high school diploma, securing a good job, and playing an active, productive role in America’s economic vitality. This year, more than 350 communities in 50 states registered online for the 100 Best distinction at www.americaspromise.org/100best. Being a 100 Best community not only demonstrates commitment to local young people; the award fosters local pride, bolsters economic development and shines the spotlight on the people and programs that are building better communities. The competition also facilitates the sharing of best practices among communities nationwide regarding education, access to health care, reading score improvement, youth service and pre-school enrollment, among many other areas. America’s Promise Alliance is the nation’s largest partnership organization dedicated to improving the lives of children and youth. Through the collective power of our partner network, we raise awareness, support communities and engage in nonpartisan advocacy to ensure that young people receive more of the fundamental resources they need to graduate high school prepared for college, work and life. Building on the legacy of our Founding Chairman General Colin Powell, the Alliance believes the success of our young people is grounded in the Five Promises—caring adults; safe places; a healthy start; an effective education; and opportunities to help others. For more information about America’s Promise Alliance, visit www.americaspromise.org.